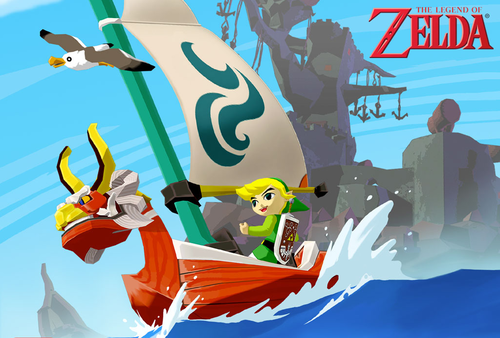 Wind Waker Walkthrough Completed, We Want Your Feedback! Today marks the last round of major updates to the Wind Waker walkthrough with the release of the two final chapters taking you through the hunt for the Triforce shards and back to Hyrule for the final showdown, as well as a guide to all the NPC characters you’ll meet during your journey. Now, I’m sure many of you have been wondering: “Why release a Wind Waker walkthrough now? The game’s been out for eight years already!” The answer is twofold: first off, we intended on releasing in-depth guides way back when the site started, but since most of us went on to college around the time we launched, it was hard to pull together enough support to get them actually finished. Wind Waker was the one we’d made the most progress on, so it only made sense to finish it up and make it our flagship walkthrough. The second reason is that we’ve got two major Zelda releases coming later in the year and we wanted to test out a walkthrough format to see how our visitors like it before we tried to put something together. We’ve got some semblance of a system down now for walkthrough production, and before we implement it for our upcoming Skyward Sword walkthrough, we’d like to ask what you think. Check below for a list of the interesting features we’ve developed and leave us a comment letting us know whether this kind of guide content meets the standard of excellence one should expect from a premier fansite. A lot of this is standard stuff, but we do a lot to go above and beyond what other fansites offer. 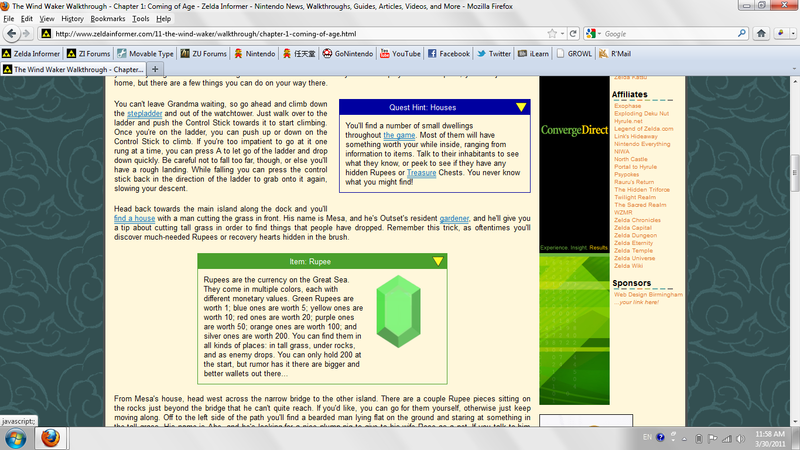 Of course there’s a Walkthrough Homepage from which you can access all of the guide content. It’s broken down chapter-by-chapter for easy browsing, so you can easily start off exactly where you need to. Within the main walkthrough pages you’ll see a list of the Chapter Objectives, Important Obtainables (Items, in other words), New Enemies, and Secrets. Each of the elements listed there is a link that will take you straight to the relevant portion of the guide. At the bottom of each page you’ll see some buttons – the one in the middle will take you back to the homepage, while the left and right buttons will link you to the previous or next chapter, respectively. Again, all about easy browsing. Where we really shine is in our screenshots and our supplementary content. Every screenshot is a thumbnail that you can click to enlarge the image and display a custom caption. Some of these captions are funny, some are informative, but all of them are part of that unique touch and the careful attention we bring to our guide content. You’ll also see various blue, green, and red boxes for Quest Hints and Item & Enemy descriptions. Click these boxes to open a drop-down box containing more information. It allows us to present in-depth information on various game elements while cutting down on page clutter, and is something that we’re hoping you guys enjoy. Of course, we have to brag about the content itself – definitely the best and most in-depth guide content you’ll find anywhere else on the Internet. There are a couple minor elements we’d like to go back and add in the future – namely guides for the Tingle Tuner and Nintendo Gallery sidequests – but we’re definitely really proud of it. That’s where you guys come in. Whether you’re new to Wind Waker or an old vet like me, your input on the content, formatting, and so on are essential to making sure we can produce the best guides for Skyward Sword come its release later this year. So check out the guide, try out all the features, and tell us what you think in the comments section!